We spent 4 whole days in Morro Bay CA at the state park with 4 other rigs and a tent. This was a complete experience for Paul and I in the rig. I went to Stockton to meet him and we drove down together. This was the longest trip for me in the rig and I wanted to drive. I started out driving from Stockton and immediately Paul started hearing noises. Now he might know how I feel when I am the passenger and all you have to think about are the noises and there are many. We stopped a couple of times and could never find the noise so we just kept driving, however Paul took over so I drove a whole 10 miles! yeepee. We didnt’ get to the campground until 11:30 as we got a little lost in Morro Bay – Picture us late at night, new place, 36′ of vehicle and the GPS tells us to turn down this street. It was a residential street up on a hill with nowhere to turn around and barely enough room to go forward. We finally got off the hill and headed back to the freeway and took the next exit after I finally remembered where we were suppose to turn. We found out the next day that the place we turned back to the freeway was the entrance to the State park!!! When we finally found our spot Paul got out and said I was going to back in. Ok! Well it actually went really well so I guess that is my new job. I am ok with it as long as I never have to handle the sewer hose I will try just about anything. Amy came up from Santa Barbara and spent Saturday and Sunday with us. It is always fun to have the girls along. They both want to know why we never had such nice digs when they were camping all the time – cause we couldn’t afford it! We had fabulous weather and lots of fun times with friends. Monday 5 of us went golfing on the course right at the State Park. The views were at least as good as the ones at Pebble Beach for a fraction of the price. I had an extremely good first 9 holes; I have to brag a bit cause I dont’ usually get to. I chipped the ball in on two holes; one for a boggie and the other for birdie! Pretty good for someone that doesn’t usually keep score cause it is too painful. Tuesday we had to pack up and head home. Paul drove because the first part of the trip is really not a good road and then when we got on Hwy 5 you would have thought we were in a hurricane. We learned yet again that there is a lot to go wrong on a motorhome; this trip we lost a vent cover, had the waterpump leak, the couch would not recline correctly, and that weird noise. All were fixed quickly by Paul so we are ready to go again. 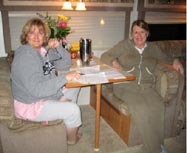 Denise relaxing in the dining room with her friend Annie! It wasn’t nearly as much fun as I thought it would be. I was at Pan Pacific getting ready to drive Rocinante up to 49er Village in Plymouth. 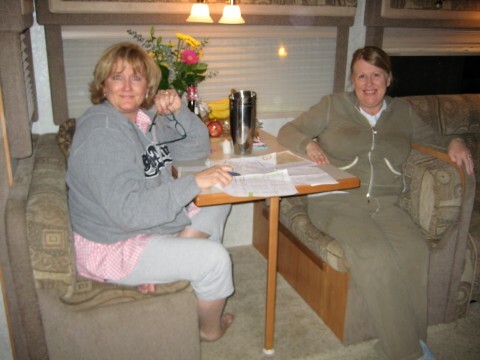 Denise and 5 of her closest friends wanted to use it as a home base for a girl’s weekend. It was to be my first time towing, but I wasn’t worried. How hard could it be? I’ve been to RV parks where 90 yr old men pull in towing their car. First off, I couldn’t find the keys to the lock on the towbar. When we picked the car up from our friend Dennis, Denise took the keys and said. I’m putting them ____ so we know where they are. Well we still don’t know where _____ is, (you will understand as you age.) The keys will turn up someday. So I took the towbar into the shop and young James helped me remove the lock with a pair of bolt cutters. It was easy. So easy that I wonder why anyone would even buy that type of lock. If a thief wanted your towbar, it would slow them down for 5 or 6 seconds. After the lock was off, I tried to connect the HHR to Rocinante. I found the receiver I had was too high. I sort of expected that, so I went into the parts department and got one with a larger drop. Then when I tried to connect the lights, I found the cord was too short. I had forgotten the there was an extension in the back of the car. I figured that I was only driving 50 miles, so I would just drive with the parking lights on. Off we go. I missed the turn to hwy 88 and had to go almost to Valley Springs before I had room to turn around. Then I missed the turn for 49 toward Plymouth and ended up in Jackson. When I stopped to figure out what to do next, I noticed that the headlights were on in the HHR. It has automatic headlights that come on when it gets dark. I tried to start the HHR to charge the battery. It wouldn’t start. So I figure I’ll deal with it when I get to the campground. Well I had put it in park when I tried to start it. When I got in the motorhome, it wouldn’t go. I knew right away what the problem was and took the HHR out of park. I finally got to the campground and smelled burning brakes. I was surprised that the motorhome brakes would heat up since it wasn’t that hilly. Then when I disconnected the HHR to back into the campsite I realized it was the rear brakes on the toad that were creating the odor. I had pulled the parking brake when I was trying to start the car in Jackson. 20 miles with the parking brake on! I’m sure I took a few thousand miles off the life of the brakes. No real damage, and a lot of lessons learned.